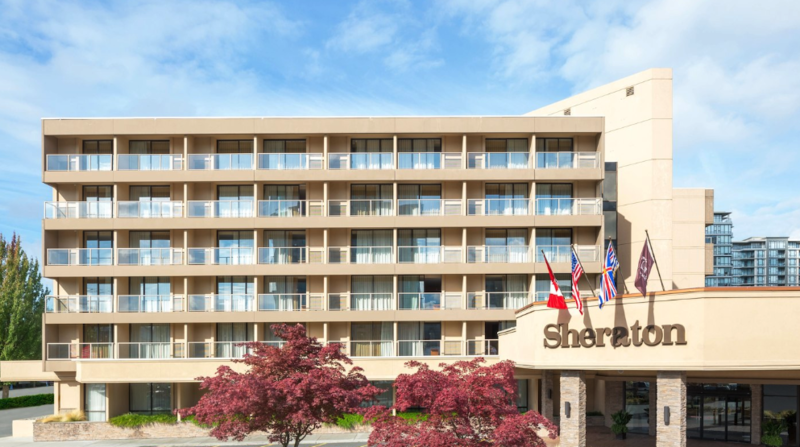 Located near Vancouver International Airport (YVR) in Richmond, British Columbia, this modern and stylish hotel and conference centre is within walking distance to the business district and Richmond Centre Mall. Stay in the well-appointed rooms with complimentary Wi-Fi, Sheraton Signature Beds, luxury bath amenities and balconies. Enjoy airport parking and a free shuttle to Vancouver Airport. The 40,000-square-foot conference centre, includes the elegant 10,000-square-foot Britannia Ballroom with 19-foot ceilings. Dine on regional cuisine at Harold's Bistro & Bar, or the full-service Starbucks®. Venture out to the lush courtyard with tables and seating. Take a dip in the outdoor heated pool, get energized in our Sheraton Fitness Centre, or relax in the whirlpool or on our sun deck. Downtown Vancouver attractions are just 12 km away. Join us in Vancouver, July 3 - 5 for another exciting Conference. There are limited rooms available with rates between $195 - $295 a night at this link. If no rooms are available using the above link please try the link for the Secondary block. Book your group rate for CASSA Conference 2019 (Secondary Room Block) for $249 CAD - $389 CAD per night. We are pleased to offer a special discount for Air Canada flights to Vancouver for conference attendees and guests traveling with them. The travel period begins Wednesday, June 26, 2019 and ends Friday, July 12, 2019. We are happy to confirm that for the upcoming CASSA Annual Conference, Westjet is able to offer 5% off Econo* and 10% off EconoFlex and Premium fares for travel within Canada and 2% off Econo*, 5% off EconoFlex and 10% off Premium base fares for guests travelling Trans-border into and out of Abbotsford or Vancouver. This offer is good for travel from: June 27, 2019 to July 12, 2019. Join us on Thursday for a tour (included in your registration fee) of a location in Vancouver, followed by a reception downtown. Buses will transport delegate from the hotel beginning at 2pm on Thursday. If you are looking for things to do before the conference or after check out this Bucket list of things to do https://www.visitrichmondbc.com/things-to-do/ compiled by Tourism Richmond. There is something for everyone including, shopping, dining experiences and plenty of outdoor activities to keep you busy.